There is a world full of help and healing above you, a world full of unconditional love and guidance below you and gentle wisdom all around you, the ancient shamans tell us. You have a beneficent spiritual teacher living in the shamanic upper world who has been looking out for your well-being since you came here. You also have a power animal ally who lives in the shamanic lower world who has been protecting and guiding you all these years. And here in the middle world where you live are trees, birds, stars, sun, moon and stone spirits all calling out to you, singing you are loved, you are not alone. As a child growing up in Michigan before I knew about “shamanism,” I was enchanted by nature and spent every minute possible climbing trees, canoeing, catching tadpoles, lightning bugs and listening to the meadow larks trill in the fields. It was a magical, highly animated world. I was one with these natural forces. We spoke the same language and shared the same joy being in water, on earth, in wind, in night and sunlight. I stayed connected with them all the way until graduate school when the bond was fractured through my living in the unnatural world of logical analysis, word swords and philosophical argumentation. My health suffered as well. I left and moved to a cabin in the forest, splitting wood, hauling water, reconnecting with what shamans call the “spirits of nature,” and healed myself. Perhaps you remember a time when you were in touch with the magical, healing world of nature — a special tree, a family pet who understood everything about you, a treasured place on the earth that welcomed you and put everything back to rights. I did not know that I was walking the beginning of the shaman’s path until I was in my thirties, nor that the rapture of childhood and rupture and illness in graduate school were part of the initiation process. It is an honor and a privilege to participate in shamanic work. An excellent way to experience shamanism is to take a workshop, learn more about the three worlds of shamanism and have contact with your own spirit teacher and power animal in nonordinary reality. In the Foundation for Shamanic Studies Way of the Shaman weekend workshop, you will learn the classic shamanic journey method of the shaman, experiencing the power of divination (problem-solving) and healing work with your own helping spirits. Drumming, the dance of animals and singing your soul’s song all give you a hands-on feel for the ancient practices of shamanism. In closing, I want to share a beautiful story with you about an Eskimo shaman, Uvavnuk, who gained her spiritual power in one dramatic instant. 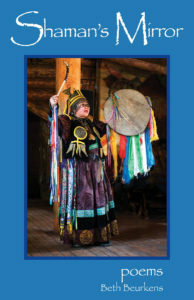 The story is told in Shamanic Voices by Joan Halifax.